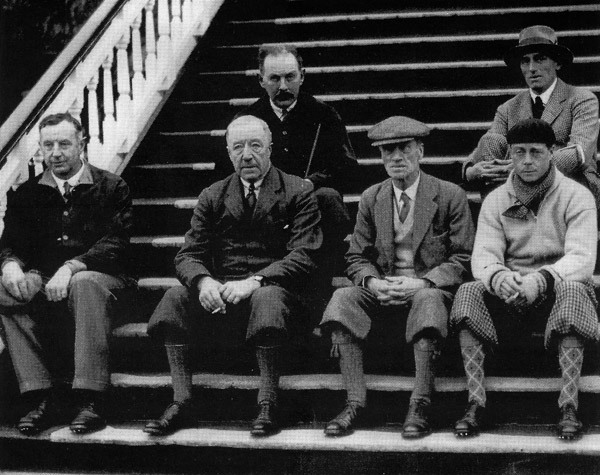 Photograph taken at the Royal County Down Golf Club in 1921. Front row: Wilson Smyth, Fred Rodgers, A. Fullerton CB and Edward Prince of Wales. Back row: Major Hammond Smith and Rt Hon Sir Harry Mulholland. Originally named Drumnagally House but later changed to Brookfield House. No record for Wilson and Vera in the 1911 Ireland Census. 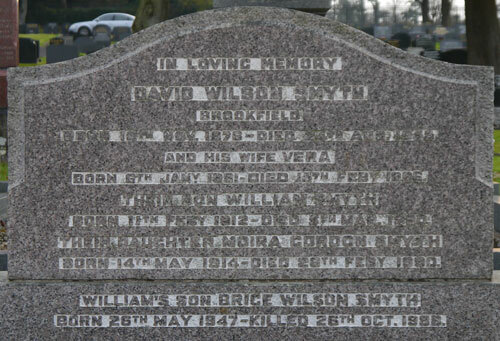 David Wilson Smyth was born on 12th November 1876, the eldest child of William's second marriage to Jane Robinson Wilson. Wilson married Vera Gordon who was born on 6th January 1881. As was previously mentioned, Vera was the aunt of Jean Ferguson, she being a sister of Malcolm Gordon, Jean's father. It was through the Gordons that the Smyths became connected to the Barbours. Wilson and Vera had five children - William, Edmund Fitzgerald (named after his uncle and better known as Teddy), Vera and Moira; a fifth child died soon after birth. Wilson and his wife lived for part of their lives at Huntly House before moving to 'The Limes' in Malone Park, Belfast. Wilson was educated at Royal School, Dungannon, County Tyrone. After his education he went directly into the family firm of 'Smyth's Weaving Co Ltd', serving for many years as a Director. He was also a Director of the 'Belfast Ropeworks Co Ltd' as early as June 1925, replacing the late R J McKean MP. Another well-known Director of the 'Belfast Ropeworks' was the Right Honourable John Miller Andrews DL MP, who succeeded Sir James Craig as Prime Minister of Northern Ireland in 1940. The Andrews family had strong connections with the Barbours, a cousin of Vera Smyth (Nellie Barbour) having married as her first husband Thomas Andrews of RMS 'Titanic' fame. The Smyth family still have in their possession a biography of Thomas Andrews inscribed "To Vera, lots of love Nellie." Norman Dickson Ferguson DL, of Clonaslee, also held the post of Director of the 'Belfast Ropeworks' at one time. In 1938 Wilson was appointed Chairman, holding this position until 1940. He maintained an interest in the ropeworks up until his death. He was also involved with the development of road transport, being one of the first members of the Northern Ireland Transport Board and later its replacement organisation the Ulster Transport Authority, of which he became a Vice-Chairman. Like his father, Wilson was heavily involved in Unionist politics, as were most of the linen barons at that time, being a member of the West Down Unionist Association and their Honorary Treasurer in 1918. When Sir Edward Carson came to Banbridge in September 1913, Wilson was a prominent member of the platform party. He was a Deputy Lieutenant for County Down between 1925 and 1928. Petty Sessions Committee (1920 to 1924). President of Banbridge Hockey Club. Member of the Ulster Club, Belfast. Past Master of Masonic Lodge No: 7. Master of the Iveagh Harriers. Joint founder of Banbridge Golf Club in 1912 and its first Captain. Captain of Royal County Down Golf Club in 1921, 1922, 1931 and 1945 and Honorary Secretary, 1936-1953. Some mention of Wilson's golfing career must be made. He was a very keen golfer and took an active part in at least four clubs - Banbridge, Malone, Mourne and Royal County Down at Newcastle. He was an Honorary Life Member of Mourne Golf Club. In 1915 he took his seat for the first time on the council at Royal County Down Golf Club. In 1921 he won the Irish Open Amateur Championship played at Royal County Down. In September the club held a dinner in his honour and presented him with a gold-mounted hunting crop, a gesture Wilson no doubt would have appreciated as he was Master of the Iveagh Harriers at the time. He also rode with the County Down Staghounds. In the same year, 1921, HRH Prince Edward, Prince of Wales (later Duke of Windsor), on a visit to the Province, came to play golf at Royal County Down and was partnered by Wilson in the game. Vera, his daughter, stated that her father was never one for standing on ceremony and he made no exception for the Prince of Wales. After playing a round of golf with the Prince, Edward said to Wilson that he would see him that evening at a dinner he was holding in Hillsborough Castle. No doubt Edward would have been surprised when Wilson replied that he would not as he wouldn't be going. However, during the course of the day an invitation arrived from Government House requesting the presence of Wilson and his wife at dinner that evening. As Vera related, it was more or less a Royal command and even Wilson could not refuse. Apparently it threw her mother into the most awful panic as she had to get her hair done and decide what to wear at short notice! A presentation board was erected in the Royal County Down Clubhouse in the 1920s recording his services to the club and his golfing achievements. He also represented Ireland at International level. From 1932 to 1938 he was President of the Golfing Union of Ireland and also once served as Vice-President of the Ulster Branch of the Golfing Union of Ireland. Wilson's daughter Vera also recalled an incident when her father went to Royal County Down for a round of golf with his friend Charlie Cowdy. After the day's game, Wilson challenged Charlie to a race home, which he duly accepted. Their cars were not sporty ones although Charlie's was the fastest, therefore Charlie gave Wilson a head start. However, Wilson decided to play a joke on Charlie and on the way home he pulled in at a petrol station in Castlewellan and turned out his lights. Charlie drove by and Wilson then drove home at his own speed. The next day both men had a great laugh about the incident. Although not terribly interested in cars, like some of the neighbouring linen families Wilson did own a 12-year-old Rolls Royce, which he bought at a cost of £150. In his younger days, Wilson played hockey and represented Ulster in the inter-provincial matches on several occasions and was once selected for an International trial. He was a member of the Banbridge hockey team when they won the Irish Cup in 1907. Wilson died on 24th August 1953 aged 76 years in the Musgrave and Clark Clinic in Belfast. An instruction in Wilson's will stated that Herbie Anderson (Snr). an ex-factory manager, was entitled to live at Drumnagally Cottage for the rest of his life at a cost of one shilling per year. THIS CHURCH BY A GRATEFUL CONGREGATION.